"I need you to be best for John, and you just let God do the rest." 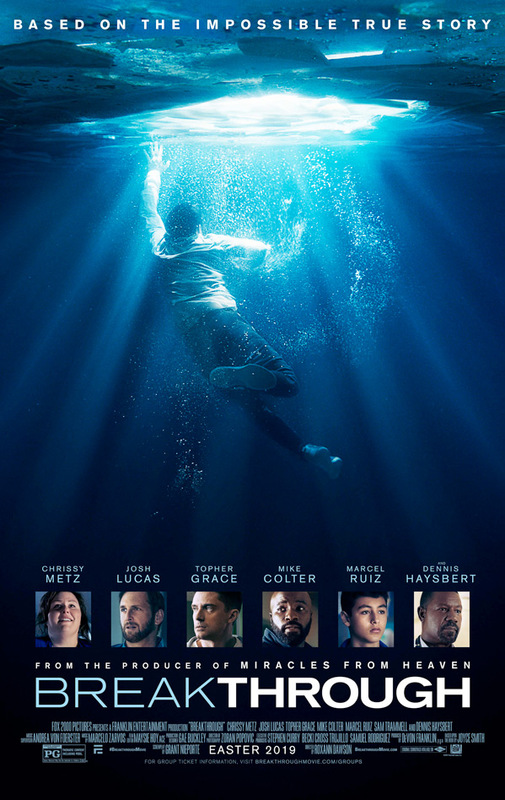 20th Century Fox has debuted the first official trailer for a religious drama titled Breakthrough, based on the true story of Joyce Smith who believes she was able to bring her son back to life through the power of prayer. When he was 14, Joyce's son John accidentally drowned in Lake St. Louis and was dead for nearly an hour. According to reports, CPR was performed for 27 minutes to no avail. Until his mother, Joyce Smith, entered the room, praying loudly. Suddenly, there was a pulse, and Smith came around. The film is about Joyce and her experiences, based on her own book. Chrissy Metz stars as Joyce, with Marcel Ruiz as her son John, and a cast including Josh Lucas, Topher Grace, Mike Colter, Sam Trammell, and Dennis Haysbert. God is as God does, folks. Breakthrough is inspired by the inspirational true story of one mother's unfaltering love in the face of impossible odds. When Joyce Smith's adopted son John (Marcel Ruiz) falls through an icy Missouri lake, all hope seems lost. But as John lies lifeless, Joyce refuses to give up. Her steadfast belief inspires those around her to continue to pray for John's recovery, even in the face of every case history and scientific prediction. Breakthrough is directed by American actor-turned-filmmaker Roxann Dawson, now making her feature directorial debut with this film after working extensively in TV before, directing a few episodes of "Mercy Street", "House of Cards", "Runaways", and "The Americans". The screenplay is written by Grant Nieporte, based on Joyce Smith's book titled "The Impossible". Fox will release Dawson's Breakthrough in theaters everywhere starting April 17th, 2019, on Easter Weekend, next spring. Anyone interested in this?